Walkwater and Abhishek Sharma’s tongue-in-cheek comedy -Tere Bin Laden stars heartthrob Ali Zafar who plays an ambitious young news reporter from Pakistan. The protagonist produces a fake Osama video and sells it to news channels when he comes across an Osama Bin Laden look alike. Now very few know that Ali Zafar has a reputation for refusing films left, right and centre. Or the fact that he is one of the most good looking and popular men in Asia. Ali Zafar was offered many films both by Pakistan and Bollywood heavyweights but he did not want to do run-of-the-mill love stories. But Ali was impressed with Abhishek Sharma’s narration and insisted on calling the film “a creative comedy” since he had never come across an original script like this one. He was even happy that he could play the role of a Pakistani in his Bollywood debut. 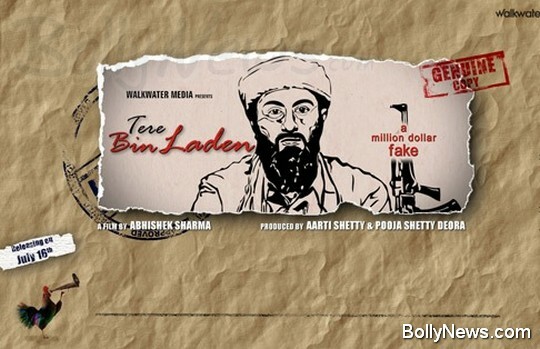 ‘Tere Bin Laden’ Destined to Rock at the Box Office!